Berry crumble – that is raw, healthy and sugar free! I have a very sweet tooth, and since being diagnosed as diabetic it is a constant struggle to please my sweet tooth, but also my meet my health targets. I love playing with food, deconstructing it down to the individual elements and then rebuilding it in a healthier way. 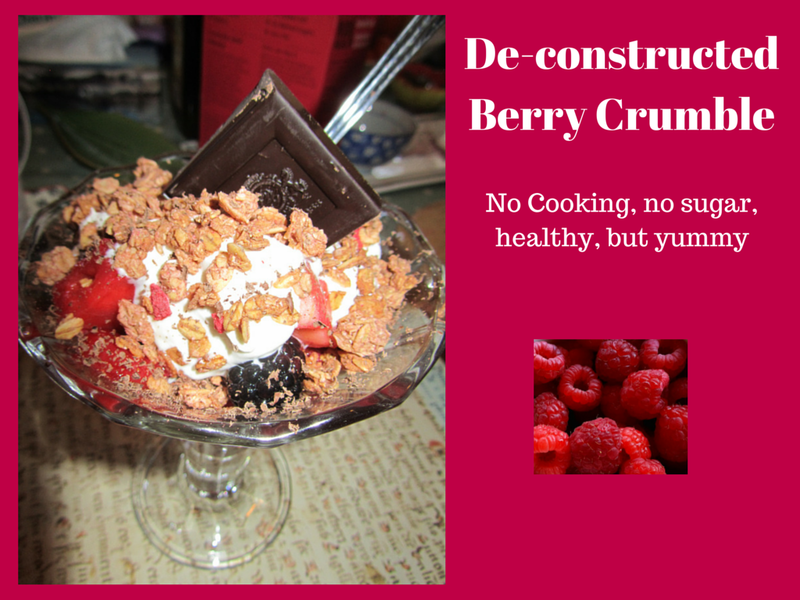 This is my take on berry crumble, with a tiny bit of naughtiness at the end. Even though there is no cooking you want to prepare your berries a good hour or two ahead of time. 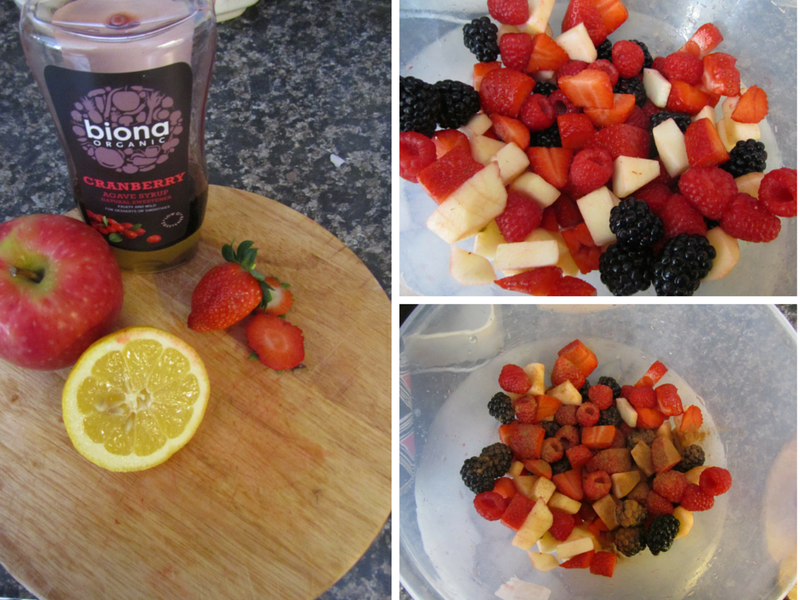 Start with your choice of berries, I had a punnet of strawberries, blackberries and raspberries. Tumble them into a big bowl and add a chopped peeled apple. Depending on the quantity, add a good shake of cinnamon (approx 1 teaspoon) and the juice of a lemon. Mix gently so the berries don’t break up. Depending on how sweet your tooth is, add some Agave syrup. I am addicted to this cranberry version from Biona Organics. Cover and leave to marinate. The acid in the lemon juice will ‘sort of”cook the berries and the apples give you a gorgeous fresh tasting berry compote. To serve simply layer up in sundae glasses (an essential ingredient for my desserts) and top with a little fat free yogurt (or coconut yogurt). I added some sugarfree wheat free granola cereal to the top. The final flourish if you are feeling naughty is a little grating of chocolate. It is amazing how little chocolate you use this way, and you can still feel like you have had a treat. Use raw chocolate for an even healthier treat. Welcome to this, the first of my foodilicious posts. I enjoy making food, and especially making food to share. Nothing is complicated, taste is my objective. My Son is my best critic, and says yum yum to this one and licked the bowl and the spoon – and he is 19! It is a fun dessert for sharing, and delivers classic cheesecake flavours in a flash. I love the idea of delivering food that is a bit unexpected. Hence Paté for dessert. Simple sweet biscuits or cookies (nothing with too strong a flavour). I used Nice biscuits, but Mariettas, digestives, vanilla wafers etc. would work just as well. Ideally make ahead of time. Whip the cream crease with a wooden spoon. Add the lemon curd. 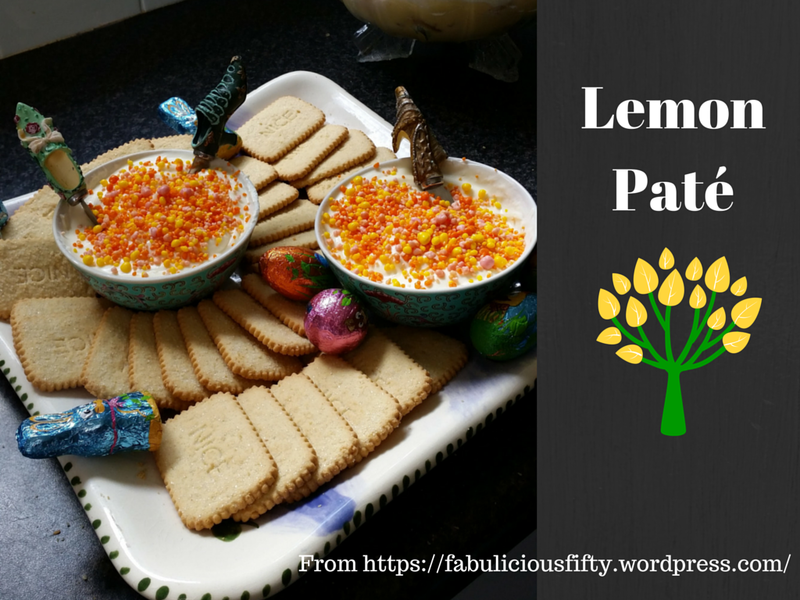 Taste as you go and add enough lemon to create a tart, yet sweet flavour. Now add a couple of tablespoons of whipped cream or creme fraiche. 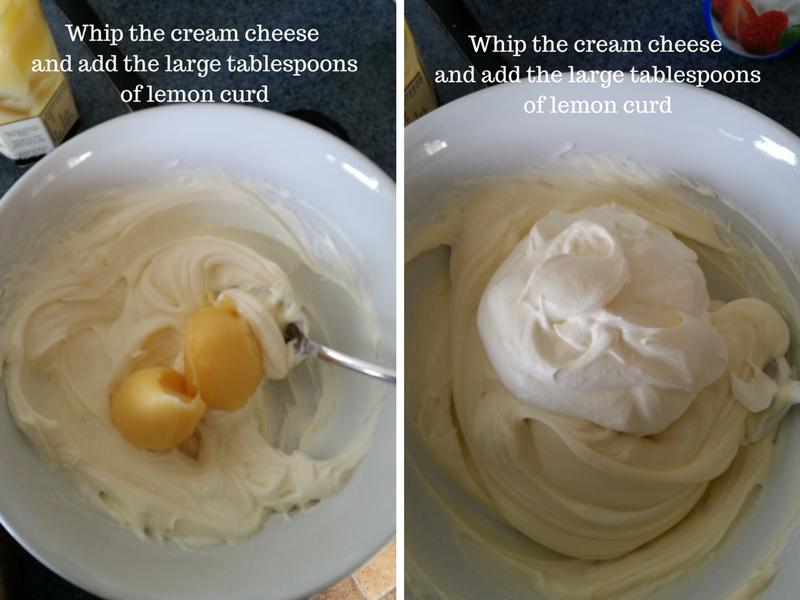 I tend to use cream for a kid friendly and richer version and creme fraiche when I want a slightly tarter version. That is it! Now refrigerate for a good few hours, or overnight if you have time. Top with zested lemon rind, or for a celebration, popping candy. Serve as you would a paté or dip, surrounded by crackers. This dish was made for an Easter celebration so we added some little eggs and bunnies. And please don’t forget to send me your feedback. Freckles, spots and other blemishes … at fifty! I would have thought that at the age of 50, I would have grown out of my freckles (as promised by my mother when I was a child). I thought that pimples and other spots would be a thing of the past – something for teenagers. Somehow this hasn’t happened. I am still get spots – too regularly and in have other random blemishes including those black shopping bags under my eyes. For someone who has been trying to be sophisticated for years, these along with the dreaded freckles, are not helping my case. Now, I have come to terms with my freckles but it has taken some time. As a small child I was obsessed with them and tried everything – and I mean everything to get rid of them. I even overheard an adult conversation where somebody mentioned urine (or was it uric acid) – and helped myself to my brothers diaper in desparation. I still shudder at the thought today. Anyway thankfully time has moved on and so has cosmetology. For a while now I have been lusting after my friends blemish palette with the green concealer. When she does my make-up all these colours are applied with skill and my skin tone is evened out. Well you can imagine my delight when I attended the Into the West Bloggers Network (ITWBN) event last Sunday and received a fabulous goody bag that contained not only one but tow fabulous skin repair palettes from IsaDora. 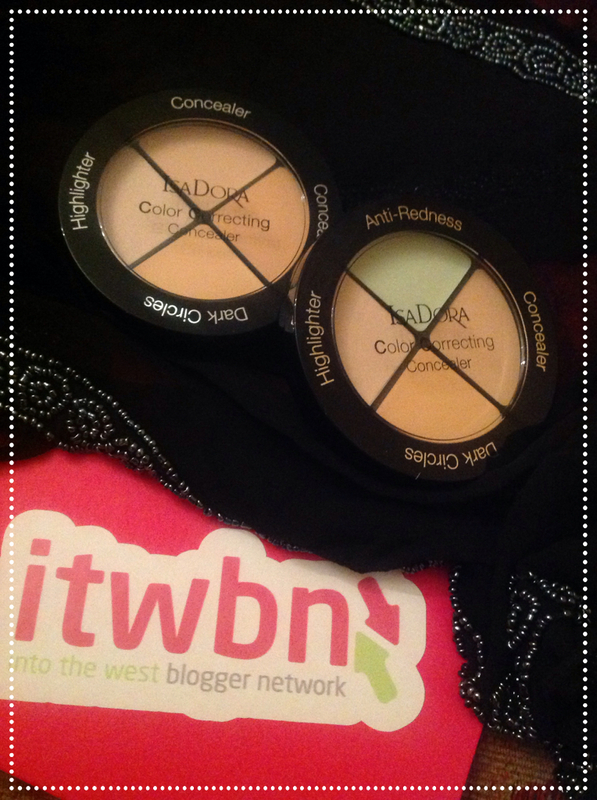 The colour correcting concealer has anti-redness (the green one) a concealer, dark circle corrector and a highlighter. The other is a neutral palette and is going to go to my sister! I have a good few blog posts that I will be sharing about this fabulous event! I came home super inspired! Thanks to Sinead and Saidbh – and welcome to all my new readers – hopefully. 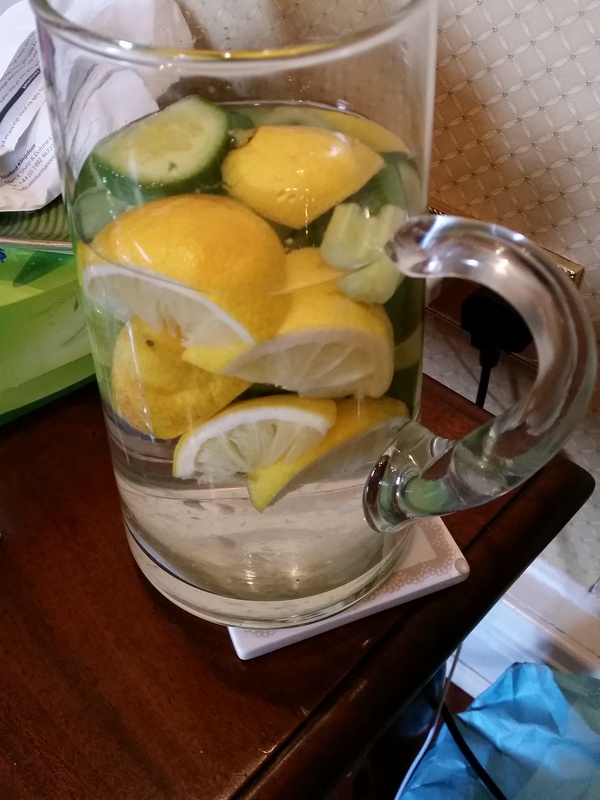 Breakfast – setting myself up for the day! As a woman who has been battling with my weight since my early teens I have read a lot, been told a lot, and learnt a lot about food and nutrition. As I am still struggling, I have some opinions on what is right and what is wrong. I have probably lost my entire body weight about 3 times (conservative estimate) over the last 30 something years. It is trial and error really. Right now I know that I like tasty food, and that I need a decent breakfast. My winter breakfast of choice is oatmeal porridge. I have some sort of childhood nightmare memory of not wanting to eat my oats and having the bowl of congealed lumpy grey mash dished up to me for a later meal. Perhaps that didn’t happen, but it lives somewhere in my subconscious. I had to overcome this. Everyone was telling me to eat porridge oats. Everything I read said eat oats. So I had to reinvent. 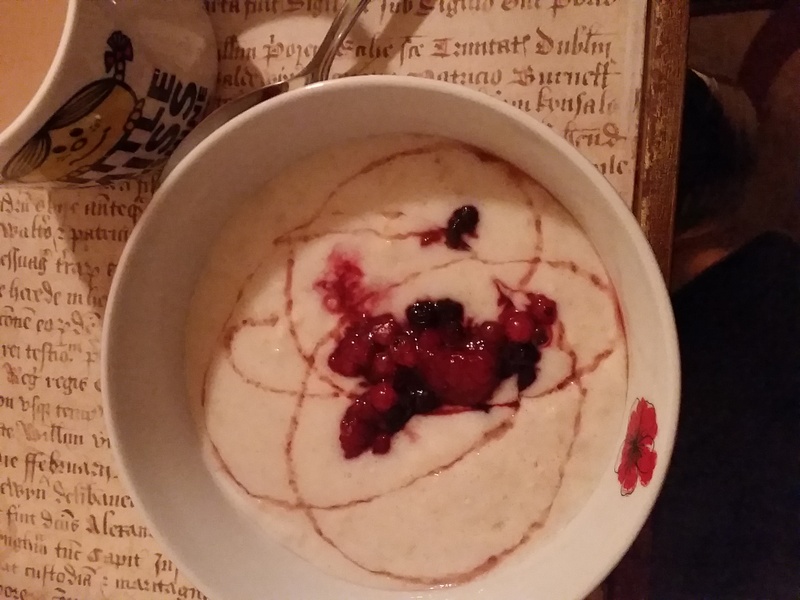 This post is about my Christmas porridge. I made it one Christmas morning, and added a naughty dollop of whipped cream – it was Christmas after all. I cook 1/3 cup of oats per serving and bring to the boil with 2/3 cup of water and 1/3 cup of skim milk. I add in a good shaking – about a half teaspoon of cinnamon, and a dash of ginger and any other spice that comes to hand. Cinnamon is great for blood sugar. 1/2 cup of frozen berries and bang them in the microwave on high for 2 minutes. Because I like my food to be pretty, I empty the berries into the middle of the bowl and make some pretty patterns with a tiny bit of agave syrup. All my breakfast essentials in a bowl and I can keep going till lunchtime (on a good day).